Ann Hegstrom is the photographer, driver, and research geek - who actually enjoys spending long evenings organizing photos and informations into web pages. She has been an elementary classroom teacher, elementary computer lab instructor, and currently works as an orientation and mobility specialist for students with visual impairments - which might explain the "travel bug" and desire to share descriptions of the journey. Gary Hefty assisted with navigation and made sure each county was visited before the first snowfall! 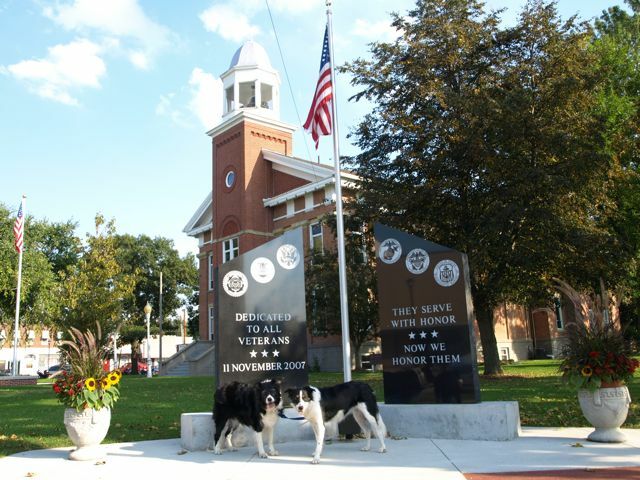 Graceland and Priscilla, faithful Border Collies, provided comic relief, and enjoyed walking around each courthouse!